Need Some Advice? Get in touch with us! The Hobie Mirage Revolution 16 boasts a long, lean hull that’s low on drag and big on speed, allowing you to glide along at a pace typically reserved for far more fragile kayaks. Width: .7 m / 27.5"
Maiden Voyage in the Hobie Kayaks Revolution 16 . If you are unhappy with your purchase in any way we will refund the item(s) in full, excluding the delivery charge, provided the items are returned carriage paid, in their original state and packaging and within 14 days of purchase. Refunds are normally issued same day of return, however we guarantee never more than 30 days. If you return an item because it was faulty or incorrectly supplied We will exchange or refund the item(s) in full including the delivery charge and we will refund the cost of returning the item to us, providing return carriage chargesare agreed in advance - in most instances we will instruct our carrier to collect on our account. Please note: We cannot accept returns for chain or rope ordered in error. We accept credit card payments from Mastercard & Visa, debit card payments from Laser & Maestro and payments via Pay Pal. If you are shopping from outside of the euro zone, your credit card company will convert the transaction to your own currency. Only '3D Secure' Credit Card transactions are accepted. If you have selected the 'Invoice with Order', we will contact you for payment which can be by : Bank Draft, Electronic Bank Transfer. or we can simply take your Credit Card details over the phone. Credit Cards are not debited until your order is ready to leave our warehouse. This ensures you do not pay in advance for backorders or items that we may not be able to deliver. Please note that all prices are subject to E and OE. Orders of excessive weight, length and volume and orders to non-mainstream delivery addresses may attract a carriage surcharge (Examples: Products - chain, kayaks, masts, boats. Delivery Addresses – Remote islands). Customers placing orders which attract a carriage surcharges will be advised to in advance of despatch. The order is not considered confirmed and no payment will be taken until the carriage surcharge is universally agreed and accepted by the customer. We endeavour to despatch your order same day as receipt. Any delays or changes will be notified to you within 24 hours of receipt of your order. You must inform us within two working days if the goods are lost or damaged in transit so that we can make a prompt claim against the delivery company and correct the problem. Please quote your order number in all correspondence. You agree that proof of delivery supplied by our delivery company is sufficient evidence to establish that goods have been received. VAT is charged at the applicable domestic rates for Ireland ( currently 23% Standard Rate or Zero Rate for certain items of children's clothing and books). All prices displayed include VAT. VAT registered Customers from outside Ireland but within the EU are exempt from VAT, subject to presenting a valid EU VAT number with order. Orders for delivery outside of the EU are exempt from VAT which will be subtracted automatically at the checkout. page. IMPORTANT NOTE - Please be aware that orders for delivery outside of the EU, may attract Import Duties, VAT & Charges upon arrival at the destination country The amount payable depends on the destination and may be subject to change. These payments are the responsibility of the customer and we accept no liability for any payments which may be due. We apply the highest level of credit card security. Credit Card Payments are directed to REALEX, our Secure Payment Gateway Providers. Here your card information is processed in the highest security environment which is PCI DSS Level 1 compliant. CH Marine accepts full responsibilty for all Credit Card transactions.Your card details are not retained by this company or on any server. All goods supplied are covered by the standard manufacturers warranty. If an item is faulty, please return it to us with a covering letter. We will then arrange to either credit you or replace the goods, whichever you prefer. 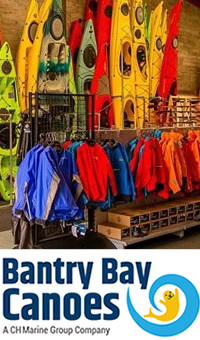 None of the above affects your statutory rights Reaching Us If you need to reach us, please email us on sales@bantry-bay-canoes.com, alternatively, you can call on +353 23-8829771 or write to us at Bantry Bay Canoes, Unit 19, Bypass Business Park, Bandon, Co. Cork, Ireland. Bantry Bay Canoes does not disclose buyers' information to third parties. Cookies are used on this shopping site to keep track of the contents of your shopping cart once you have selected an item, to store delivery addresses if the address book is used and to store your details if you select the 'Remember Me' Option. Bantry Bay Canoes will always conform to the requirements of the Data Protection Act, 1998.